I found the book very interesting, and I thoroughly enjoyed reading it. My favourite part of the book was when Otto, the main character, is hiding in an elevator shaft in order to escape his rival gang. I would have lied to see more drama and suspense. I have given it 4 out of 5 stars for enjoyment. This book offers a fresh perspective of World War Two. It was set in Berlin in 1945, at the end of the war. Also the novel is packed full of historical facts. Although Otto, Helene, Ulrich and the others are fictional, I can feel the real situation that hundreds of children did not have the shelter of adult protection in a chaotic and dangerous environment. My favourite parts of the book were when Otto leads one band of kids which were separated from their parents and stranded on the edge of death and live. They camped out in the basement of a mined building. Otto and Helen tried their best and put a lot of effort into ensuring that the other young children didn't suffer starvation and were safe. But scavenging is hard and dangerous work. Also, Otto's younger brother was a loyal Nazi. It's difficult to control. I would like to see more suspension and investment. I would give it 4 starts in recommendation. The books have a very remarkable and unprecedented plot development. Instead of exaggerating the power of the main character, the writer writes about how they suffer from war and conflict. My favourite part of the book is when the writer always refers the story line back to the main theme of fate. The Wolf Children, who tried to fight for their German citizenship and right to live, had been suppressed by the Soviet Union and changed their lifestyle. I would give it five stars out of five. It was certainly an amazing book with an exhilarating plot. Personally, for me, I enjoyed this historical fiction book, talking about the fall of Hitler's Third Reich leaving Germany in ruins. I find the two main protagonists Otto and Helene extremely brave and heroic. I didn't really have a favourite part of the book because I think the book in general is well-written. Especially when Otto leads a group of children who have been separated from their parents to survive. They had to eat stale bread which develops sympathy from the reader. For improvements, I would like it if the ending was more gradual and slow, building up to an end. I felt as if the ending was too sudden and unexpected. I really enjoyed the book due to how historically accurate it is. He shows the side of Nazi Germany usually not talked about. I really liked that is historically based yet fictional. Improvements: I would have liked to see more about Nazi Germany and how people felt about Hitler. I didn't feel like it was a World War Two setting and although it is an interesting concept it didn't work. I would give it four stars out of five stars. The book was very factual (accurate historical information) and well researched. It contained very lively/exciting descriptions of scenes including aspects of war debris and signs of personal touches/stories. My favourite parts of the book where when Ulrich brims with tears when Otto falls unconscious in front of him. The description of his emotions ('Don't die on my brother') were moving and touching. Improvements: The storytelling could get slightly dull at times. I would give it 3.5 stars out of 5 stars. I enjoyed the book very much. It had all the elements I like in a book such as action, adventure, romance and a bit of comedy. It also reminded me of the Berlin Trip and how old some places are such as the KaDeWe and Alexanderplatz. My favourite part of this book is when Ulrich and others beat up Ernst and explode him to smithereens. Also I like the part where Hanna describes her experience with the kidnappers and how she escaped. I would not improve much, except a bit more violence and mystery, looking into labyrinth of houses? I would give it five stars out of five stars. It was a great read which kept me on the edge of my seat. Sometimes interested and amazed how well the narrator (Otto) gets himself out of sticky situations. My favourite parts of the book: One the night after that raid - 'luminous cherry blossom'. The perspective of the effects of the war on ordinary people living in Berlin. Specifically the children trying to survive. The detail of beauty and nature contrasting against the horrors of war is written spectacularly. To improve: I felt that the ending was erratic, I would have liked to see more of Ulrich's response to the period after the war, especially when his views were changing. I would give it 4.5 stars out of 5 stars. The book follows Otto and his group of friends between the ages of 6-16 trying to live in Germany just after World War Two is finished. I found this book a great read since I was able to relate to what the characters where having to do to survive. I found that the book didn't start off that great but after the first chapter I was not wanting to put it down. I liked the ending of the book and how Otto's brother Ulrich has to betray a person who he called a friend so that they can both go and see their father who they found with the thanks of Hellen. This book has helped me to understand what it was like after WW2 and even though I haven't studied the topic yet I think this book will have widened my knowledge. Overall I would definitely recommend this book to anyone who likes adventure, wars and Germany since it is such a thrilling read and one that you will not want to put down. I really like how Paul Dowswell illuminates history with this story about children living in Berlin in the days of Germany's defeat in World War Two. There is a lot of factual information as it is well researched and it shows real-life situations of what children like those had to go through. One of my favourite parts was when Otto and Ulrich were being hunted down by another group of boys. It was a very a very thrilling moment because you didn't know if they were going to die or not and they only escaped by the skin of their teeth. I would have liked to see more build up and suspense. For example, when a group of children were playing with a bomb which exploded, killing them, I could sort of see it coming. I would give the book 4.5 stars out of 5 stars. I really liked this book and its plot, especially the perspective of the effects of the war on ordinary people living in Berlin, particularly the children struggling to survive. My favourite part was when Ulrich and Ernst drank together alcohol in Russia style. It really made me laugh when it said that a small bottle of vodka was there. I would like liked to see more of Ulrich's response to the post-war period, particularly as he was still struggling to change his views. 'Wolf Children' follows on after the destructive WW2. Set in Berlin, this book tells the take of Otto and his gang as they try to escape capture from the Nazis in a dark hospital cellar. Many people have been shot. Women have been raped and a dark feeling is drifting through the city. This isn'tto be ignored, as one day an old friend comes and everything changes. Wolf Children is a very moving story and is based on a true story. Even though I cannot argue this wasn't a good book, it wasn't for me. I felt the characters were not explained very well and that the story line was not very intriguing. I decided not to finish the book as I didn't enjoy it. I did find this story very moving though as it took you through time and I felt I got a full experience of how life was for children and what they had to go through in order to survive; this was just my personal opinion and from my peers they found this book very enjoyable. I enjoyed this book. I thought that the brother of the main character, Ulrich, was a particularly interesting character as he was strong minded and determined but viewed as an anomaly in a society that was trying to change and rebuild. He was persistent throughout the first half of the book, having a stubborn and aggressive peronality compared to later on in the book where he was emotional and easily pained. I think that the historical aspects of this book were very realistic as it includes lots of monumental events in World War 2 and it uses a wide range of German and Russian titles when addressing army people of diffeent ranks. I would definitely like to learn more on this subject as this book has given me a new perspective to the after effects of the war and the way people were treated. These things would not normally be discussed in a history lesson as it isn't deemed important. I would like to read more books by this author to see if his other writing as as interesting and opinionated as this book is. I really liked the book as it really pulled me in and made me sympathise for the characters. The characters are all very complex and most of them were realistic and reasonable which helped me like them more. This book also helped me see a different side of things as when we learn about history you never know what happens to the Germans and this book helped me learn about it in a really interesting way. This book definitely made me want to learn more about the history and other books the author had written. Overall, I really liked the book and characters, found the plot and ending realistic and I would rate this book 9/10. I thought that the book 'Wolf Children' by Paul Dowsell is a very interesting book. I think this is because I personally think that you have to be committed to it if you want to finish it. I think this because it is a veryup and down book.Â There are stages of the book where you can't stop reading it and then there are others where I had to force myself to read it just to get through it. I found it interesting finding out how they had to survive and how they didn't give up.Â I would definitely read it if you like reading about war and survival. I really enjoyed reading this book as it had a lot of the historical aspects and the techniques the author uses give an understanding of what it was like to be a youth in post war Berlin. The author made me want to find out more about the war and about the jobs of women. I thought the history in the book was accurate because there was a lot of true facts in it. Also, the locations are true [a majority]. An event I really liked was the part where Ernst finds out and fights Ulrich, Otto and Helene as it is action packed and tense. My favourite character is Helene because she is kind, considerate and feisty. I really enjoyed the book and I liked how it relates to wars because I have an interest in them. I really liked the history involved in it so the author has done a brilliant job. If there are other books from this author, I would like to read them because I like adventure and thrilling books. 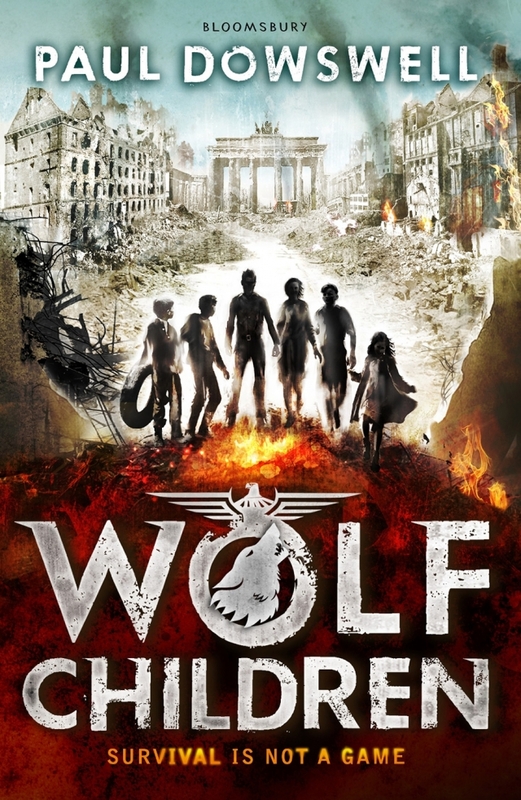 The book is set in the ruins of Berlin just a few weeks before the end of the war. This book gave me lots of information about how Germany was split up after the war which I didnâ€™t know. It also showed me what life was like for the civilians. I enjoyed the ending but I was disappointed that we didn't get to find out what happened to Erich and Klaus or if Otto and Ulrich met their father. Wolf Children by Paul Dowswell is a truly compelling novel. Dowswell is able to successfully capture the reader's attention page after page. This thrilling novel juxtaposes the value of friendship, endurance and perseverance with the post-World War Two setting in Berlin in 1945. The story follows six children who live together in the basement of a dilapidated hospital. There are the twins, Erich and Klaus who find enjoyment in alighting unexploded bombs. The two brothers, Otto and UIrich, who never give up hope of finding their parents. UIrich is still worshiping Hitler and grasping onto any last thread of finding a member of the resistance who he can join. Their friend Helene, is an extremely strong and brave young woman who takes up the responsibility (with Otto) of providing their group with as much food as they can find in the ruined city of Berlin. And finally, Hanna. The eight-year old girl who mysteriously disappears- leaving the rest of the group secretly and unintentionally thinking about whether she could be the next victim of the rumoured cannibal attacks. Dowswell cleverly adapts his tone and adjusts it to fit this time period while being sensitive to the events that took place. The novel gives readers a different perspective from what they may have learnt in the classroom, a child's perspective who had been part of a wealthy family in the past, and in an instant they were stripped of it all, left to survive on their hind legs. This novel depicts the story of ordinary people living in Berlin, focussing specifically on children who struggle to survive and find food. Overall, certain elements of the novel were realistic and historically correct- referring to the many mentions of Hitler Youth and the Ubermensch. Furthermore, information about the indoctrination of children firstly, through the education system (Race Studies and Eugenics) and later by taking control of their time at home using Hitler Youth. Reading this novel aided the understanding of what life was like for the thousands of people living in the ruins of Berlin and what their struggle involved post-World War Two. This novel is a great read and it stands alongside other historical novels such as The Silver Sword as it takes historical events that took place relatively recently, and puts them into perspective. Did you enjoy the book? Yes, I enjoyed that the book was written about young children and it isnâ€™t something that is talked about a lot. Is there a special character or event or place that you particularly liked or thought was good? When they found the young girl alone I felt the vulnerability and loneliness she felt. Do you think the history in the book was realistic? yes, it had many facts about Nazi Germany and what happened in 1945 after the fall of Hitler. Did the book make you want to find out more about history? Yes, when I read the book we were learning about Germany as well. Did the book make you want to read more books by this author? Yes, the characters have real depth and you can connect with them. Is there anything else you want to say about this book? I fell this book shone a light on something so important and something so horrid that we can almost believe will never happen again.